Note: Devotion taken from last Sunday's sermon on John 8:21-32. And ye shall know the truth and the truth shall make you free (John 8:32). What is the truth? Christ is the truth (see John 14:6). And you shall know the Lord Jesus Christ and the Lord Jesus Christ shall make you free. Christ brings freedom! Here is a great irony: Unbelievers think that becoming a believer brings restrictions, but, in truth, faith brings liberty. One is free from the fear of dying in his sins. One is free to know and obey and serve the Lord. The language here would have had a very deep impact on the hearers of the first century who lived in a society in which slavery was common. 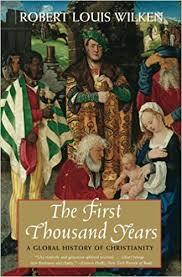 I recently read a book describing the first century Roman ceremony for freeing a slave, a solemn event that was held before the magistrate (see William Stearns Davis, A Day in Old Rome, p. 140). And with that he was manumitted and became a libertinus, a free man. I declare that this man is free! I desire that this man should be free! And, I adjudge (declare) that this man is free! Meditate on the freedom one can have in Christ. Who is your master? Who has the key to your life and your heart? Is it something or someone in this life, or is it Christ? The Lord Jesus Christ holds out this promise to those who believe in him: You shall know the truth, and the truth shall make you free! And Peter went out and wept bitterly (Luke 22:62; cf. Matthew 26:75; Mark 14:72). This may perhaps seem a rather unextraordinary episode, albeit a moving one. But therein lies its peculiar grandeur. 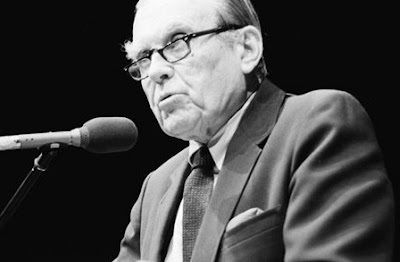 To us today it seems only natural that a narrator should pause to record such an incident, and treat it, with certain gravity; but, in the days when the Gospels were written, the tears of a common man were not deemed worthy of serious attention. They would have been treated by most writers as, at most, an occasion for mirth. Only the grief of the noble could be tragic, or sublime or even fully human. 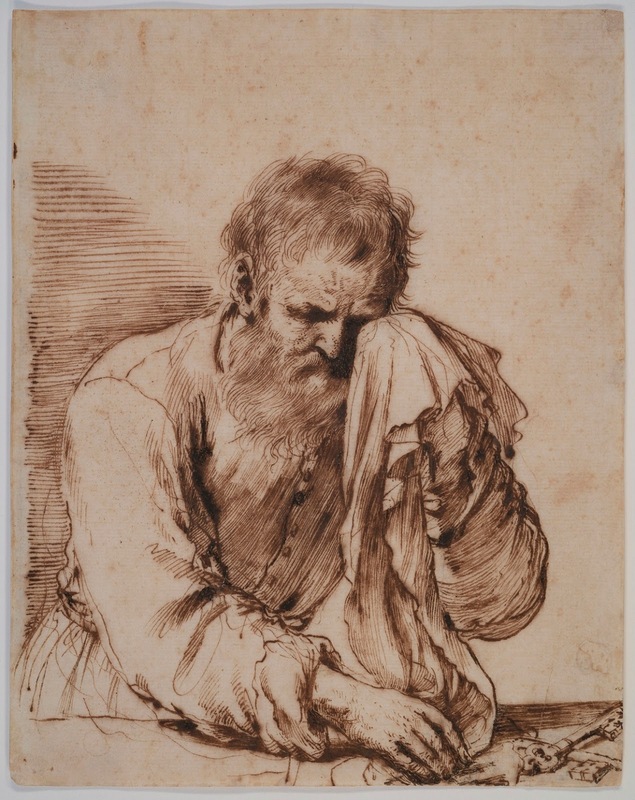 The tears of Peter were therefore indicative of a profound shift in moral imagination and sensibility. Something had become visible that had formerly been hidden from sight. For Christian thought, God had chosen to reveal himself among the least of men and women, and to exalt them to the dignity of his own sons and daughters. And, as a consequence, a new vision of the dignity of every soul had entered the consciousness of the Gentile world (18). WM 94: Of Effectual Calling is posted. You can listen to it here. It’s been a while since I posted a WM. This has probably been the result of baseball pre-season practices getting started. 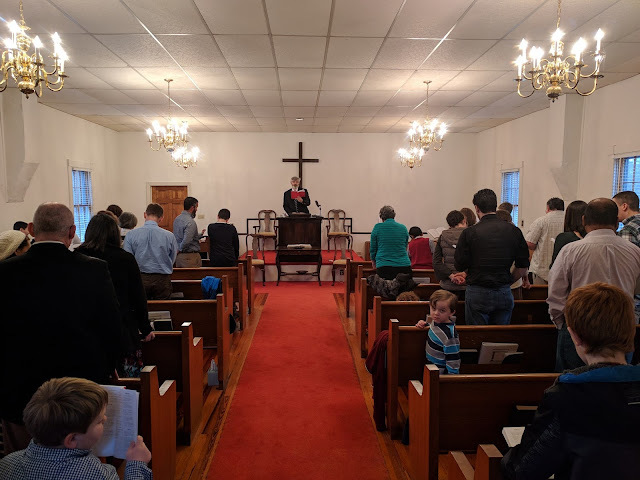 Anyhow, this episode was recorded yesterday following the afternoon Lord’s Day service at CRBC. 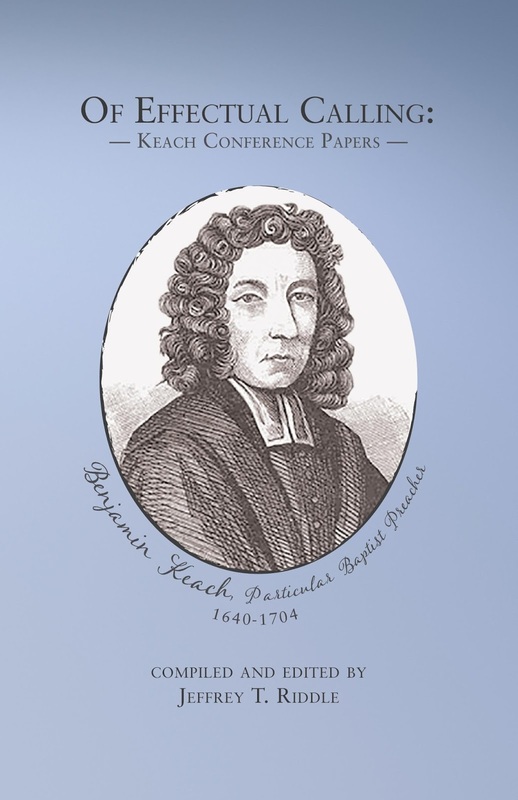 In it, I have a discussion with Ethan McGonigal and Jason Anderson about a new booklet I have compiled and edited, titled Of Effectual Calling: Keach Conference Papers (Trumpet Books, 2018). Get a single copy: $7.99 (no shipping cost). Order books by emailing: info.crbc@gmail.com. Make sure to specify the number of books ordered and a provide a valid mailing address. The Vision: The creed of unbelief: "Thy record is not true." Note: Devotion taken from last Sunday's sermon on John 8:12-20. Then spake Jesus again unto them saying, I am the light of the world: he that followeth me shall not walk in darkness, but shall have the light of life (John 8:12). The Pharisees therefore said unto him, Thou bearest record of thyself; thy record is not true (John 8:13). It can be a pretty dauting things to make that confession. Maybe some of you remember the time when it dawned on you: Hey, you know, I really believe this. I really believe the gospel. I know this is not some fairy tale, but this is true. This is the truth. And I believe in Christ! Is your spirit going to rest easy with being in a state of unbelief or, as Christ called it, “walking in darkness”? So, we are left to ask: Which sphere are you in? Where are you walking? Are you in the darkness? Or do you have the light of life? Has Christ done and is he continuing to do a work of spiritual transformation and translation in your life? Do you respond to Christ’s claims in faith as Peter did in John 6:69? Or, do you say to Christ as those Pharisees did, “Thy record is not true.”? And are you willing to live with the consequences of such a stance? It is costly to follow Christ. But it is costlier still to stay in the darkness and NOT to follow him. The barbarians of the present day are naturally savages in their habits, and as long as they sacrifice to their idols they rage furiously against each other and cannot bear to be a single hour without weapons. But when they hear the teaching of Christ, forthwith they turn from fighting to farming, and instead of arming themselves with swords extend their hands in prayer…. These facts are proof of the Godhead of the Saviour, for He has taught men what they could never learn from idols (91). The Saviour is working mightily among men, every day He is invisibly persuading numbers of people all over the world, both within and beyond the Greek-speaking world, to accept His faith and be obedient to His teaching. Can anyone, in the face of this, still doubt that He has risen and lives, or rather that He is Himself the Life? Does a dead man prick the consciences of men, so that they throw all the traditions of their fathers to the winds and bow down before the teachings of Christ? If He is no longer active in the world, as He must needs be if He is dead, how is it that He makes the living to cease from their activities, the adulterer from his adultery, the murder from his murdering, the unjust from avarice, while the profane and godless man becomes religious? If he did not rise, but is still dead, how is it that he routs and persecutes and overthrows the false gods whom unbelievers think to be alive, and the evil spirits whom they worship? For where Christ is named idolatry is destroyed and the fraud of evil spirits is exposed; indeed, no such spirit can endure that Name, but takes to flight at the sound of it. This is the work of the One Who lives, not of the dead; and more than that, it is the work of God (61). 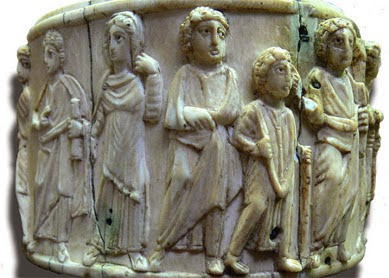 Image: Ivory pyxis from Egypt (c. 5-6 century), depicting the woman taken in adultery. National Museum, Paris. Note: Devotion taken from last Sunday's sermon on John 8:1-11. And Jesus said unto her, Neither do I condemn thee: go, and sin no more (John 8:11b). 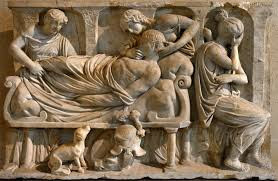 The woman taken in adultery passage (John 7:53—8:11) is perhaps the best loved, and the most controversial, and the most misinterpreted account in the Gospel of John. It is perhaps the best loved, because it is in miniature the story of every believer. Perhaps we have committed outright adultery or we have committed mental or emotional adultery. We have broken God’s laws. We have committed spiritual adultery by having other gods above God. We have been caught in the act, and we have no excuse and can make no plausible defense for ourselves. We deserve everything we ought to get. We are exposed. And there is only one who can judge us, and it is a holy God himself. But then he sends forth his own dear Son to stand in our place and to take upon himself the wrath we deserve. So that, for us, there is now no condemnation. The “hanging” judge then takes us from the criminal court to family court, and he grants us spiritual adoption so that we become co-heirs with his own dear Son. Certain persons of little faith, or rather enemies of the true faith, fearing, I suppose, lest their wives should be given impunity in sinning, removed from their manuscripts the Lord’s act of forgiveness toward the adulteress, as if he who said, “sin no more” had given permission to sin. Christ couldn’t have done this, some think. But he did. And the saints of God will never let this precious account slip from God’s Word. It is perhaps the most misinterpreted. How many have mis-used, “Let he who is without sin cast the first stone” to cover, ignore, justify, or obfuscate their own sin? They do the same with Matthew 7:1. Somehow, they conveniently miss consideration of Christ’s final words to this woman: “Go, and sin no more.” Christ not only saves men, but he also changes them. He calls them to live in ways above and beyond which, humanly speaking, they are capable. And this casts them again and again at the feet of Christ, confessing their sin, seeking his forgiveness, and being helped up again to walk in newness of life. Let us treasure this Word. Let us defend this Word. Let us rightly divide this Word. 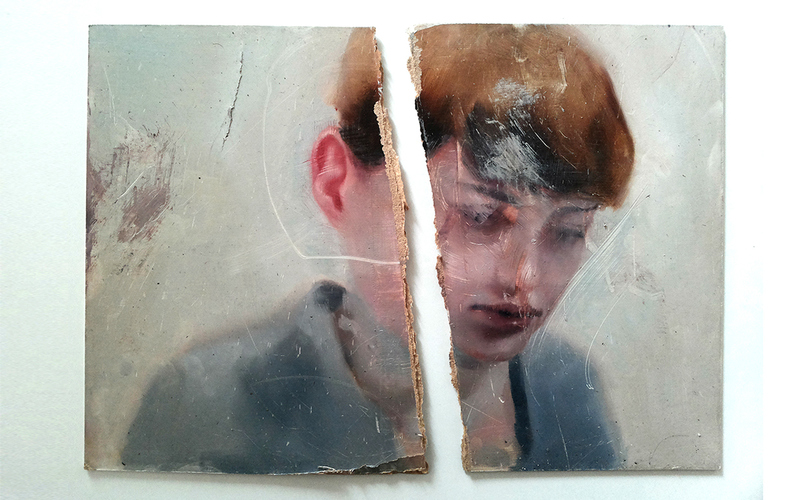 You know what happens when a portrait that has been painted on a panel becomes obliterated through external stains. The artist does not throw away the panel, but the subject of the portrait has to come and sit for it again, and then the like-ness is re-drawn on the same material. Even so was it with the All-holy Son of God. He, the image of the Father, came and dwelt in our midst, in order that He might renew mankind made after Himself…. (42). You cannot put straight in others what is warped in yourself (42). 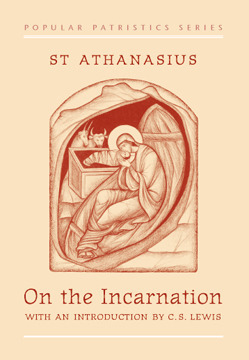 I got started last Sunday preaching through chapter 8 of the confession “Of Christ the Mediator.” To prepare I’m reviewing Athanasius’s On the Incarnation (using the volume in the Popular Patristics Series from SVS Press). You know how it is when some great king enters a large city and dwells in one of its houses; because of his dwelling in that single house, the whole city is honoured, and enemies and robbers cease to molest it. Even so it is with the King of all; He has come into our country and dwelt in one body amidst the many, and in consequence the designs of the enemy against mankind have been foiled, and the corruption of death, which formerly held them in its power, has simply ceased to be. For the human race would have utterly perished had not the Lord and Saviour of all, the Son of God, come among us to put an end to death (35). After a long period of instruction and moral formation, those who had been accepted for baptism were to bathe, fast, and present themselves to the bishop…. Baptism took place at daybreak. A tank or pool would be filled with water, and the catechumens (those who had been instructed) would take off their clothes to prepare for immersion. At this period of Christian history most people who were baptized were adults. But in the midst of the description of baptism the Apostolic Tradition inserts the surprising sentence: “You are to baptize the little ones first.” Apparently infant baptism was permissible—though not conventional—and parents or guardians would speak for the children. Then came the men, followed by the women, who were to let down their hair and take off any jewelry. Nothing could be taken down into the pool. First, the bishop would anoint each person with oil, “hand over” the trinitarian rule of faith, immerse the catechumen three times, and anoint him or her with oil a second time. Then the newly baptized were clothed, and the celebration of the Eucharist followed (176). 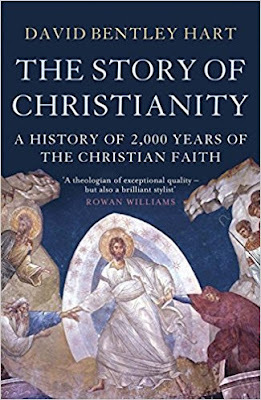 I was interested in the fact that Wilken affirms both that baptism was practiced by the mode of immersion and that the baptismal candidates were typically adults. We see the practice of infant baptism developing, but, according to Wilkin, it was not “conventional.” Paedobaptist Protestants not only have to explain the lack of warrant for infant baptism in the NT but also in the predominant practice of Christianity in the opening centuries of its existence. Bathing, wine, and love-affairs—these hurt our bodies, but they make life worth living. I’ve lived my days. I reveled, and I drank all that I desired. Once I was not then I was; now I am not again—but I don’t care! (173). It struck me that the Christian belief in the resurrection would have been very strange to the Romans, not to mention the Christian proclamation, as summed up in places like John 3:16: “For God so loved the world, that he gave his only begotten Son, that whosoever believeth in him should not perish, but have everlasting life” (John 3:16). Such beliefs made the early believers willing to suffer and even to die as martyrs. They were not living for just this life. One can see how this was not only strange but, most importantly, winsome and attractive. In a room where people unanimously maintain a conspiracy of silence, one word of truth sounds like a pistol shot (13). Certainly, the illiterates of past centuries, then an enormous majority of mankind, knew little of the history of their respective countries and of their civilizations. In the minds of modern illiterates, however, who know how to read and write and even teach in schools and universities, history is present but blurred, in a state of strange confusion (14). Moreover, events of the last decades, of such primary importance that knowledge or ignorance of them will be decisive for the future of mankind, move away, grow pale, lose all consistency, as if Friedrich Nietzsche’s prediction of European nihilism found a literal fulfillment. “The eye of a nihilist,” he wrote in 1887, “is unfaithful to his memories: it allows them to drop, to lose their leaves…. And what he does not do for himself, he also does not do for the whole past of mankind: he lets it drop” (15). Image: Scene from Lord's Day worship at CRBC. Paul and Timotheus, the servants of Jesus Christ, to all the saints in Christ Jesus which are at Philippi, with the bishops and deacons (Philippians 1:1). When is a church a church? What make a church different from a fellowship, a Bible study group, or a para-church ministry? Our Particular Baptist forebears addressed these questions in chapter 26 of the Second London Baptist Confession (2LBCF). They concluded: “A particular church, gathered and completely organized according to the mind of Christ, consists of officers and members….” (26:8). One of the proof texts they offered was Philippians 1:1. We have a narrative in Acts 16 of the founding of the church at Philippi under the ministry of Paul and Silas. Lydia, the seller of purple, and the Philippian jailer, as well as members of their respective households, were among the first converts who were baptized and apparently formed the nucleus of a developing church. No mention is made in Acts 16 of officers being appointed. But when Paul writes his later epistle to the church (Philippians), it is clear that officers have been named. Paul writes to the saints (the hagioi, or “holy ones,” not super-Christians but the whole people of God made set apart by Christ), along with their bishops (episkopoi, or “overseers,” a term used interchangeably with presbyteroi or “elders”—see Titus 1:5-7) and deacons (diakonoi). A church, it seems, can come into existence when God’s people are gathered and are “giving themselves up to the Lord and to one another” (2LBCF 26:6), but it is only “completely organized” when it has Scriptural officers “for the peculiar administration of ordinances, and execution of power and duty, which he instruct them with, or calls them to” (26:8). I preached and taught on this topic last Sunday at the meeting of the Lynchburg RB Mission. Continue to keep this ministry in prayer as it develops and we move forward. 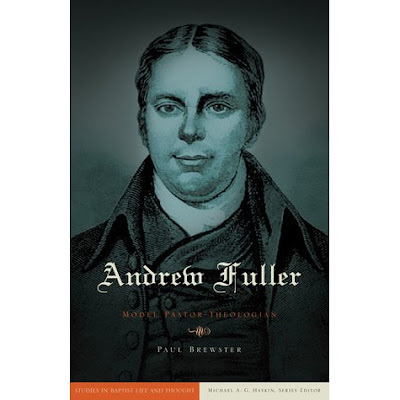 I have posted an audio version of my book review of Paul Brewster's Andrew Fuller: Model Pastor-Theologian (B & H Academic, 2010) which appeared in Puritan Reformed Journal, Vol. 4, No. 1 (January 2012): 328-330. You can listen to the review here. You can read it here or here. Note: There are several errors in the written version--no doubt attributable to me--that I tried to correct in the spoken version. 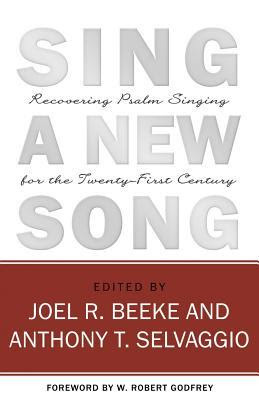 I have uploaded a spoken version of my book review of Joel R. Beeke and Anthony T. Selvaggio, eds, Sing a New Song: Recovering Psalm Singing for the Twenty-First Century (Reformation Heritage Books, 2010) which appeared in Puritan Reformed Journal, Vol. 4, No. 1 (January 2012): 325-328. You can listen to the review here. You can also read it as a pdf here or here. Note: Devotion taken from last Sunday's sermon on John 7:40-53. 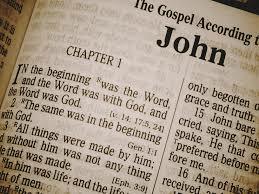 The officers answered, Never man spake like this man (John 7:46). What a powerful presence and speaker Christ must have been during his earthly ministry! He drew men like a magnet to himself. He mesmerized men with his words. Calvin reminds us that one can admire the doctrine of Christ and yet not yield to Christ. These officers were impressed by Christ but we are not told of repentance and faith in him. And yet I think this description is meant to make us consider how believers are so often drawn to Christ by the power of his words. We might wonder why God in his wisdom did not choose to have the Word be made flesh in the age when video images and sound could have been captured. We can speculate about what it would be like to have an audio or video recording of Christ. But God in his wisdom chose not to send forth his son into such an era, and his timing is perfect. I have heard some very compelling speakers in my day. Through the miracle of modern technology, we can listen to many of the great speeches made in the modern era. But this verse reminds us that no man ever spoke like Christ. No man ever spoke with his authority. And though, in God’s perfect timing, the Lord Jesus Christ did not come in a time when his words might be recorded on audio or video, the Lord did see that his words be preserved for us in the Word of God written. "I am the bread of life: he that cometh to me shall never hunger: and he that believeth on me shall never thirst" (John 6:35). "If any man thirst let him come to me and drink" (John 7:37). Do you hear in the voice of Christ the voice of your shepherd? Do you acknowledge him to be the Son of David, the Messiah, the prophet greater than Moses? If so, you can say with all who have been indelibly impressed by Christ, Never man spake like this man. 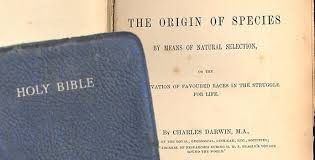 Charles Darwin's On the Origin of Species (1859) not only influenced re-calibration of the interpretation of the historicity of Genesis, but it had wider influence in other areas of Biblical interpretation as well, such as source criticism and the so-called Synoptic Problem. In his “response” article in The Synoptic Gospel: Four Views (see this previous post), Two-Gospel Hypothesis advocate David Barrett Peabody addresses the “problem of omissions” objection against Markan Posteriority. This objection—lodged by those who hold to Markan Priority—suggests that Mark could not have been written after Matthew and Luke, because, if this were the case, it would not have omitted so much of their material. Mark, the shortest Gospel, must have been earliest and expanded upon by Matthew and Luke. So goes the theory of Markan Priority. The “problem of omissions” may have been raised by those who presuppose that the Gospel tradition always grew by incremental gain (perhaps under the influence of Darwin’s theory of evolution, once it appeared), and placing Mark’s Gospel third in the order of composition of the Synoptic Gospels clearly does not conform with Darwin’s theory, which never should have been applied in the field of literary criticism in any case (149).